Presented here, a fabulous Swing Handled Taghkanic Splint Basket, c.1920's, in a beautifully patinated, warm, nut brown color. This basket displays many of those classic basketmaking techniques that we see in those baskets called Taghkanic or Taconic, also known as "Bushwacker Baskets", from a Township in the lower corner of Columbia County in New York State, of the same name, pronounced Ta-kon-ik. These wonderful baskets were made by immigrants from the Palatinate, a district of southwest Germany located west of the Rhine, who came to America just before the Revolutionary War and settled in the area along the east bank of the Hudson River, just south of Albany, New York. When the Revolution erupted, these recent immigrants, who sided with the loyalists but wished to avoid conflict, abandoned their homes and hid in the wooded hills where they lived in simple shacks, safe from both the patriots and the British soldiers. Surrounded by good, plentiful timber in their woodland home, they turned to basketmaking as a way of supporting themselves. They lived there in the hills, marrying and intermarrying and keeping to themselves. They lived an isolated existence, and in many cases, even intermarrying or marrying the native American Indians (Mohicans) who also called this region "Home". Their land, which was poor for farming and limited to little patches of corn and potatoes, was an ideal environment for basket trees - brown ash, oak, hickory and maple. Somewhere they learned to make baskets, and the baskets gave them a living. They didn't have to be where the market was, but simply where the trees were. These basketmakers were typical of other makers in the way they practiced and passed on their craft . . . much like the Shakers who also lived in insulated communities. As to construction, the classic Taghkanic basket is a round bottom, round top, and swing handled basket, though they did make fixed handled baskets and handleless baskets also, about 20% of the time. The profile of the rim is another distinctive feature . . . a sort of compressed capital letter "D". Most other basket rims are taller than they are thick; the Taghkanic rims are the opposite. And, because they are thickened laterally, Taghkanic rims extend out from the top edge of the basket more, giving it a very special look. Where the uprights are turned down under the rims, the turndown is short. They have very short tails, and they're turned alternately on the outside and the inside, outside and inside. The rims are always double lashed to the body and they're always crisscrossed nicely . . . especially around where the handle is attached, to give it strength and to prevent racking (or loosening). Where the uprights are turned down under the rims, the turndown is short and they have very short tails. A coiled piece of splint that forms a foot was sometimes applied to the bottom of a Taconic basket to protect it. (This detail is very common on Indian baskets from the Northeast, but it is less common on non-Indian baskets). When used, fixed overhead handles are single notched at the rim, and the shelf below the rim is squared and blocky. The ends of the handle were shaped to tails and extend far down into the basket to prevent slipping. Whew! 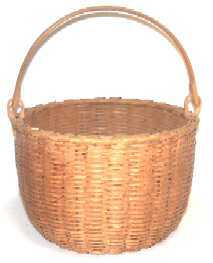 The basket presented here is a round bottom, round top basket woven of brown ash. It has a wonderful kicked up bottom and double wrapped rim. When looking into the bottom of the basket, note how the uprights taper in as wedges toward the center, cross the center in one even narrow width, and then taper out again as wedges. This manner of laying a bottom is not limited to the Taconics, but you won't see a Taconic round bottom that isn't like this. If you look into the bottom of the basket you will see the "tie" which is a signature mark of these baskets. While the "tie" is not always there, Taconic baskets have a recognizable look, regardless of size and shape. The overall condition is super! For the reasons outlined above we can give this wonderful basket a Taghkanic attribution with absolute certainty. They just made a basket one way, and that was their signature. In any event, this sturdy basket is a masterpiece of basketmaking and deserves a place of honor in any basket collection. 7-7/8" dia. x 5-1/4" high.